Figure 1: A screenshot of the custom Java-based Kappa simulator and visualiser used for the majority of the modelling work for the project. The modelling component for the 2010 University of Edinburgh iGEM project used a number of Kappa-based stochastic modelling tools, including RuleBase and simplx. In addition we made extensive use of a custom Java-based Kappa simulator and visualiser (Figure 1). This simulator started out as one of the outputs of the degree project of one of our modellers, and was extended to suit the intra- and intercellular modelling of the FORTH light communication framework. The Edinburgh iGEM 2010 modelling tool simulates an extended variant of Kappa capable of representing spatial location of agents and events. These extensions made the tool particularly suitable to represent the signalling model in Kappa. Individual bacteria in a 2D biofilm were represented as a hexagonal mesh. Each cell in the mesh represented a single bacterium, running the full intracellular model. Light based communication between adjecent bacteria was represented by the transport of agents representing light 'particles/photons' from one bacteria to a neighbour. By appropriate selection of creation, transport, light sensing and degradation rates, the stimulation of one bacterium by light emitted by its neighbours can be modelled. 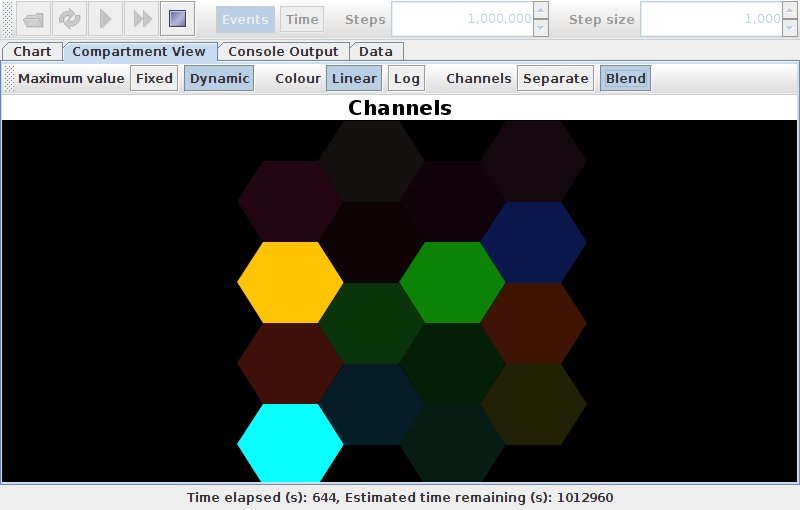 The Edinburgh iGEM 2010 modelling tool can be obtained from here.